Left alone, solar electricity will hold its own against utility power. But in Topeka this year there are two proposed laws and a rate hearing that might have a profound effect on renewable energy in Kansas. The first is a law rescinding the property tax abatement now given to the value solar hardware. This might tax every solar family in Kansas, though rural people might be able to justify a portion or more as "agricultural equipment" that is exempt. Today, it is difficult to make an appraisal of solar hardware's worth in that property value is based on a set of characteristics, i.e number of bathrooms, or finished basement. We don't know of a set of values for the various types of solar hardware. A house's value is determined by what a comparable house sold for. For solar electric systems, there are few of us in town, and none have been up for sale. Where are the comparables? The second law, as it stands imposes an excise tax on systems that are big enough to export more than 500 kWh/day onto the powerlines. 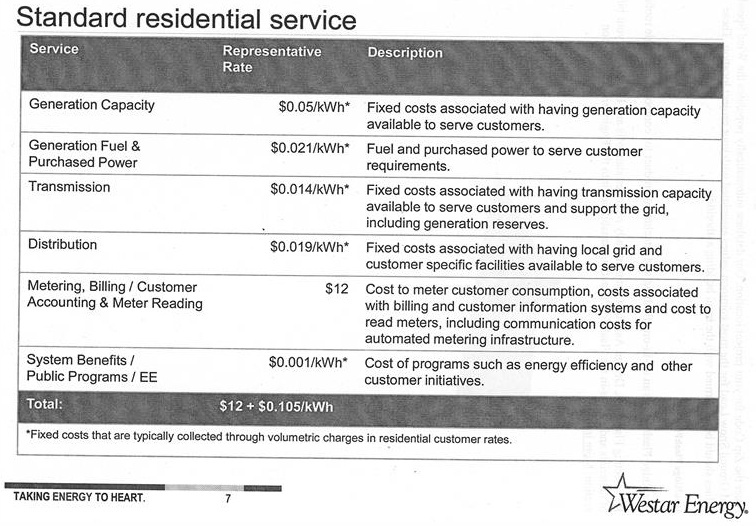 Oddly enough, these are the classes of customers who will benefit Westar the most. Their power-use peaks very closely to that naturally produced by the sun. These are taxes would be self-reported to the Kansas Dept of Revenue and it seems to me there would be limits to enforcement. And while laws can be amended on the fly in committee, I think it will be difficult to apply this tax to smaller systems. The rate case illustrates how this all is coming together for Westar. In last year's legislature, the net metering law grandfathered customers who installed systems before July 1, 2014. This rate case as proposed is to apply only to solar "self-generators" who go solar after the Oct 28th deadline. So, when under these rate hearings all Westar customers' base rate is raised to $27/month, will ours be locked in at $12 for the next 15 years? And all new solar customers who install after July 1, 2014 and before the deadline of Oct. 28th, will they be "grandfathered" in ... under the conditions the legislature defined last year ... with net metering at no additional cost but with the compensation of only the cost of fuel (~3.4 cents/kWh) in excess of what they consume month to month? Then there will be the future batch of solar customers who will have a choice between two different, but much higher base rates. This is so patched together that we should not be surprised if this whole thing is thrown back before the legislature and to the KCC, to make it more uniform. Whatever the outcome for Westar solar customers (new after Oct. 28), it will have little if any impact on our Bluestem Rural Electric members. Westar as a typical urban utility, has somewhere in the range of 60 to 70 customers/mile of line. The average for Kansas Electric Cooperatives (KEC) is 2.3 customers/mile. Bluestem's assets are almost totally in distributing power to its members. If Westar's distribution system accounts for $0.019/kWh, then Blue Stem's distribution system is a huge part of our members' bill. Rooftop solar offers great savings. For the same reasons REC's were the last to be brought central electricity, they will be the first to gain from Distributed Generation. Kansas Rural Electric Cooperatives (and municipal utilities) should already buy their base load wholesale and encourage/finance their members to generate their own peaks. It would add reliability, provide voltage support and will save all our members on the cost of shortened transformer and other hardware life. Powerlines will not spend as much time sagging into tree branches. If we can generate our summer afternoon peak loads on rural homes and outbuildings, we gain independence from monopoly control of our most expensive electricity. We are getting calls regularly from Blue Stem members and others across the state, who want to get on our next buy. It makes every sense for them to get into this without the seven month wait it will take for the KCC to announce its decision in October. 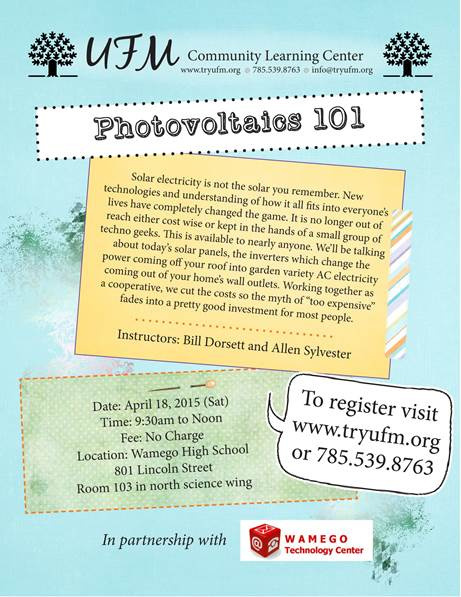 We are offering a free Solar Electricity 101 presentation, 9:00 to Noon, Saturday morning, Apr. 18 at the Wamego High School. Bring a friend. We'll try to leave time to answer questions as we go along. We can count on attacks from Investor Owned Utilities (IOU's) for a very long time. They have an interest in maintaining their monopoly. Even waiting for these hearings will cause us to lose seven months of the time we have to install systems with the certain 30% IRS tax credits. The other groups who are most likely safe investing in solar electric systems will be those Westar customers 1. who have already installed systems and want to expand and 2. probably those who will get theirs in before the KCC makes its decision in October. Let's get on with ordering. We had our first board meeting. Safety was a big topic. We decided that we would buy new safety equipment for people passing panels onto, and mounting them on roofs. We also agreed that General Liability and Directors & Officers insurance was important for us to have. And because insurance requires us to define who are "members" and who are bystanders, we needed to arrive at a definition. We concluded that an approved application with annual membership fee of $15 and participation in our activities will make you a member. We are putting together a website on which our application will be posted. You can find our preliminary website at: www.fhreec.org. Since the Kansas legislature has been in our face these last couple years, we decided that we needed a Governmental Concerns Committee to keep track of their shenanigans. And because changes in solar energy and energy storage are happening so fast, we began a Technical Review Committee (for more: http://blog.rmi.org/blog_2015_04_07_report_release_the_economics_of_load_defection ). If you wish a copy of the board minutes, they will be posted on the website as well. Our board members are Eva Zurek, Jim Sherow, Robert Rosenberg, John Selfridge, Bruce Snead, Madonna Stallmann, Jacque Gibbons, Cherri Harper and Bill Dorsett. Members are invited to attend meetings. The next one is May 7, 6:00 PM to 8:00PM. Location to be announced.